The guitar consists, normally, of six strings. The strings generate different tones by their vibrations. They are set up to a specific tuning (usually what is referred to as the standard tuning), and the strings have various thicknesses that also affecting the sound. The strings are normally tuned as EADGBe from the lowest to the highest note. It is important that you don’t mix up the lowest string with the bottom string and the highest string with the top string. The sound of the lowest strings includes more bass than what the highest strings does. If a comparison is made to the piano, the thickest strings, and especially near the neck, are comparable to the keys on the left side of the keyboard. In the standard tuning, EADGBe, there are two strings what produce an e tone, when played open. These are referred to the low and the high e-string. The E on the thinnest string is two octaves higher than the other E. The high e is often written as a small letter to distinguish it with its duplicate. In addition, the strings are often referred by numbers. So, which is the first string and which is the last string? That's a great question, since they are not indicated on the instrument. 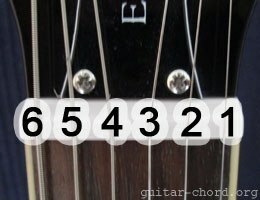 A tip for easier memorizing is to associate the thinnest string with the lowest number. If you feel uncertain concerning the positions of the notes related to the open strings and the frets, there are ways to get around that kind of problems. For example, you could use special made color codes decals as in the picture below.